That’s what Bob, the Bay Area Motorcycle Trainer told me. He’s probably right. Especially as I’m learning to ride in mountain lion territory. I have a 1982 green Yamaha Seca, bought from Craigslist and patched up with eBay parts. It cost $650, which is less than the price of the new glasses I just bought. The mirrors are from Brooklyn. The new tachometer is from Florida. The rear brake light is from the Kragen in Sunnyvale. The replacement clutch lever, broken when I dropped the bike doing a “low-speed manoeuvre” (a 5-mile an hour U-turn in a redwood cathedral), comes from–well, I don’t know where Tim got it, to be honest. Motorbikes are his department, as books and chocolate bars are mine. Shortly after he bought the green one for me, he picked up a red Seca II from my Bernal Heights neighbor, and then, a few weeks ago, added a blue Kawasaki KLX650 Dual-Sport when we realized the winter rains would soon muck up Sal’s dirt road. Tim pores over the Motorcycle Owner’s Manuals (“Got a question? Ask MOM.”)He sits up late on a cellphone dial-up connection to eBay, and spends Saturdays afternoons cleaning the carburetor so that the green bike no longer hiccups like a drunk. He rarely falls into the gumption trap. He guides me, at 30 miles an hour, to the DMV parking lot in Los Gatos, where I practise unsteady figure-eights on the driving test course. In return for his patience, I try to be a good sport about riding motorcycles. The first time Tim drove his red bike from my neighbor’s house to his shack, an hour and a half south of San Francisco, he sent me a delighted email. After two years of Silicon Valley commuting–did you know that rich people can lead such depressing lives that for two hours a day, reading vanity license plates counts as distraction?–he’d regained some of his old spirit. “I felt like I was describing a line on the curved surface of the earth. Like I had reconnected to the sights and smells of my surroundings,” he said. It helps that Route 280 is carved through beauty, and that the Skyline Boulevard, which coils above it to his home in the mountains, is a famously spectacular motorcycle ride. Woz lives up there. I don’t share Tim’s passion yet, though we took the same weekend training course. I lack his physical confidence, and I don’t have an understanding with these mechanical beasts. But still I like my bike–a bit–though it often scares me to shaking. Then he wiped off his hands and asked questions about the engine, which I couldn’t answer. Told me to be careful. But there’s no telling people to be careful, is there? The truth is, I’m so cautious that I’ll loop right around and meet danger coming backwards. The truth is, it won’t be lack of care, but lack of competence, that will test the stiff padding on my rider gear. And as a long-time acoustic bicyclist, I can hardly believe how little motorcyclists can hear from inside those cheek-squashing helmets. How much can care make up for deafness? The most terrifying part of motorbiking, I find, is the loneliness. It’s easier to face danger when someone else might be in charge. The only way I made it down Sal’s Canyon was to shout at myself as loudly as I could, coaching like a dad who just took the training wheels off a daughter’s bike. I heard my coach’s instructions, and my own dad’s voice, raising in spite of himself, as he tried to teach me to drive in the Raheen Industrial Estate on wet Sunday afternoons. I sputtered down the dirt track, past the nudist camp, and out onto Alma Bridge Road. 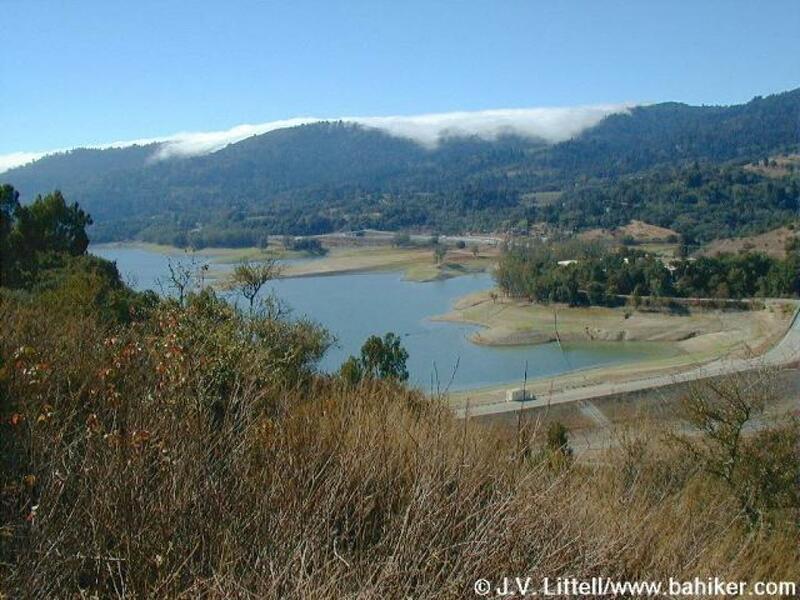 Crawling around the Lexington Reservoir in first gear, a spandex man passed me on a racing bike–going uphill. It’s motorcycle territory, those beautiful swooping backroads in the Santa Cruz mountains, and the biker tribes are friendly. Dirt-bikers, dual-sportsers, cruisers, choppers, and hogs all offer the same low, one-handed greeting, even to me, even though I can’t return the wave for fear I’ll fall off. The dirt-bike kids wear the outfits I should have: bright, armor-padded Kevlar, and Flash Gordon boots. The old lads on Harleys wear leather vests in the summer, and soup-plate helmets. The sports bike guys look good, padded up for brawn. Me, I was sweaty in heavy gloves, jacket, helmet, and boots in beach weather, and by summer’s end, my gloves stank. It’s unsettling to realize how much I’m de-gendered on a motorbike. Putt-putting up a hill, I look like some skinny, nervous guy on an old rice rocket. I can’t cute my way out of a damn thing, and though that’s never been a mainstay of my survival skills, I confess that I’d like to be able to fall back on it when my incompetence is so marked. Once I lost my nerve on a steep hairpin bend, and abandoned the bike to cry on the shoulder. Once I fell off. Once (last weekend), I went 35 miles an hour on the highway. Since those first forays, though, I’ve got a little better. Leaning into a turn, when I already feel unbalanced, still doesn’t feel good or sensible to me yet, but my brain can make me do it. Instead of sitting meditation, I take big, slow breaths on the green Yamaha Seca, feeling the flow of pushing my mind to its limit and keeping my body as quiet as the redwood cathedrals I pass through. While Tim hunted tachometers, I found unworn Emma Peel leathers on eBay, offered by a guy who was bitterly selling a gift bought for his “now EXXXX-girlfriend. Tags attached.” Toe tags? No matter. Nothing like playing dress up to bring me around to a new hobby. Tim says that in the parking lot at the Los Gatos Safeway, the yummy mummies check out guys in motorcycle gear–the pads are placed, after all, to flatter that silhouette we cavewomen are primed to respond to. More affectingly, he says, middle-aged guys in expensive SUVs give him an unmistakable look: wistfulness, envy, maybe even regret. “If it weren’t for these little shitheads…” he imagines them saying about the kings of the carseats, whom they serve faithfully. Today, at the gas station, a middle-aged Russian guy approached Tim as he filled up my bike. Maybe he thought he’d found a fellow Russian–that used to happen all the time in Brighton Beach. He used to ride, he said, and he missed it. In the Urals. They traded stories for a while. His $60,000 car shone nearby. “How much was it?” he wanted to know, nodding at the tinny little bike. Tim told him–about the price of dinner for two in Manresa, down the road. Freedom was that cheap? He backed away, amazed. Let the Nobs stay up on their hill and the hipsters stick to Hayes: Visitacion Valley is the most evocative name in the city, and as a neighborhood, it’s preserved, for now, by those nose-wrinkling write-ups. It’s the last stop before you leave San Francisco for the cubicles of Silicon Valley. Perched above it, on the San Bruno Expressway, a cocked martini glass invites commuters to stop for one for the road at a Russian cocktail lounge. Some neighborhood history is written in the streets: the Mexican names, the boarded-up restaurants that used to sell Louisiana chitlins, the Indian Baptist Church, the Chinese and Vietnamese-language dailies in the newspaper vending boxes. It’s half Asian now, and most of the residents were born in another country. On Leland Avenue–storefront churches, nail salons, and lunch shacks–I dithered over what to eat. Fried chicken or beef pho? It turned out that the Sunflower Blues Cafe, with its improbable indoor picket fences and yellow gingham table cloths, wasn’t opening until next week, though Marcus, the owner, was proud to show off how good it looked already. Everything made from scratch, he said, and healthy ingredients, salads and grilled stuff, though of course they’d do fried chicken, too; no sense being _extreme._ He’d started his family young and brought them over to Vis Valley from Bayview. They were grown now, though he didn’t look more than forty. He owned a few properties in the neighborhood, and his wife ran the beauty salon up the street. Julia here used to work for her, he said, and Julia was the best. Could I figure out how to get her to come on board with him? Julia shrugged and giggled, not yet convinced. At the Vietnamese place next door, my beef pho came with tripe and tendon, and a bush of basil leaves. The fish sauce was given out without asking. I ordered _ca phe sua da_ and thanked the waiter in dredged-up Vietnamese. I was proud, but he was baffled until I gave in and pointed to the number on the menu. The broth was as good as Hanoi, and the decor very nearly worse. A gnarled Chinese lady, bent low, haggled in the 99 Cent Store. I paid full price for a bottle of Elmer’s Glue, some Chinese birthday cards, hair clips, and a flashing bike reflector. Up the road, in Portola, there’s an old cinema that’s a Baptist church now. I’m a lapsed-Catholic-aetheist-Buddhist, but even I’d go to a church with a drum kit behind the Hammond organ. A nearby diner looks untouched since the 1920s, apart from the laminated waffle menus in the window. But in keeping with the neighborhood changes, those red vinyl booths and swivel stools are now wiped down by owners who got here from Seoul four years ago. It was closed, on a Sunday morning, and on the store window next door, a poster warned residents to be wary after several recent attacks. In the supermarket, frogs squatted in their tank, eyelids heavy. Sunday must be frog night, because they were stacked halfway up each other’s backs like toppled dominos. Three aisles over, you could choose from six brands of canned quail eggs, five kinds of canned rambutan, and a fridge full of sticky drinks. In the checkout queue, with an armful of mangosteen jellies and Vietnamese espresso, I almost wept at the sight of a box of durian fruit inside the front door. In deodorized America, it’s stinky, oozy, primal, pheromonal durian I’d like to offer instead of Altoids. The other day someone asked me if I still had the travel bug. Truth is, I never did, even–and especially–when I wore a backpack for a year. I’m a homebody; at most a reluctant daytripper, and sniffing a durian on San Bruno Avenue is all I need before heading back to my rocking chair to look down over the city.